"Hi Mr Chong, we would like to order a group caricature picture for 15 pax in one picture using pencil ($25 per person). Please see the group picture with 15 people within. I can send you more for reference if required. Hope the resolution is sufficient. This is for my Japanese boss as his departure gift (the guy in green T-shirt), we are thinking of ‘sports theme’ to highlight the good teamwork in our organisation. 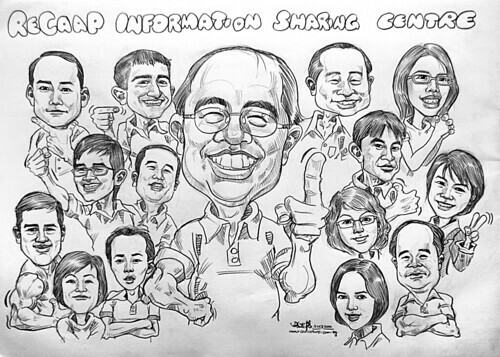 We would like to include our organisation name in it “ReCAAP Information Sharing Centre” somehwhere..."